We know that when children learn to share, or not to wallop one another when they get cross, or to use the toilet properly, they do so because we’ve taught them that this is the right way to behave. So it seems amazing to me that anyone would dismiss the gendered labels and marketing that are plastered across toys, books, clothes and children’s media as having no direct influence. Children are listening, trying to work out the right way to be a boy or a girl. There really isn’t a princess gene. Girls learn that their appearance matters more than what they do because they’re surrounded by fairies and princesses, given hairclips instead of toys, complimented on their dress instead of their ideas or their skill. Boys learn that males are more important, because female characters are secondary, or all too often absent altogether. They learn that associating with anything pink, or feminine is taboo. 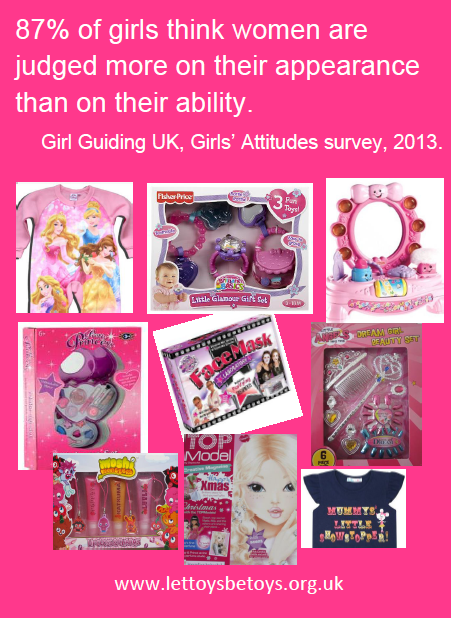 But if we tell them that being ‘like a girl’ is so terrible, what does that tell them about girls? We expect children to take other things we tell them seriously, so there’s no reason to assume they’d shrug off ‘That’s for girls’, and therefore ‘Not for you.’ If we want our children to grow up with the widest ideas of what they can achieve, how could we think this trivial? People sometimes believe that if toys are divided starkly into boys and girls, then this must somehow reflect underlying reality – that companies only sell what consumers want. But toy companies sell what will make them the most money. Convincing parents and children that boys and girls need different toys, that things can’t be shared or handed down, is far more profitable than selling products than boys and girls can both enjoy. Decades of gendered marketing makes this feel normal or inevitable to us – but that really isn’t the case. Marketing is effective, or they wouldn’t spent so much money on it. But children are being sold a dangerous lie that boys and girls can’t like the same things. Female characters routinely disappear from licensed toy lines because it’s believed they ‘won’t sell’, which is highly circular. You can’t buy what’s not there. There are plenty of examples of how girls go missing – Big Hero 6 t-shirts with only 4 heroes on them. Avengers Assemble, but guess who didn’t turn up in any of the tie in promotions. 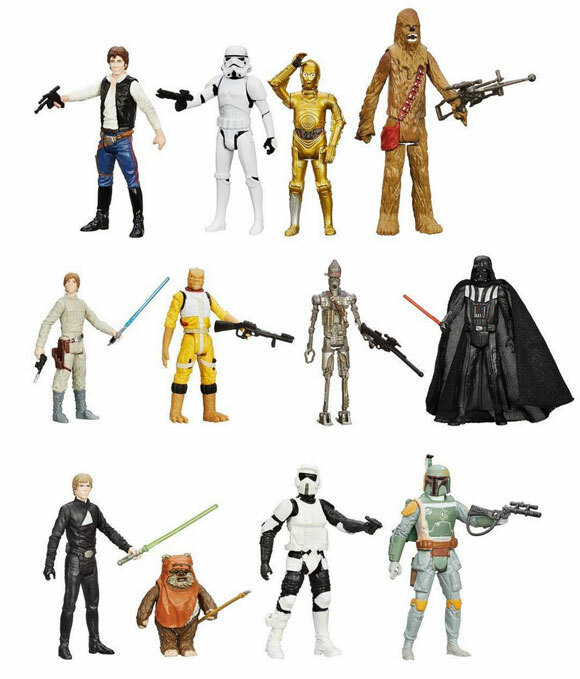 Hasbro released a set of 12 figures to commemorate the digital re-release of the original Star Wars films. It contained two Luke Skywalkers, but no Leia. Hasbro released a 12 figure set to celebrate the rerelease of the original Star Wars film. Luke Skywalker’s in there twice. Leia’s missing in action. It’s also incredibly frustrating when great characters become gendered through licensing. The BBC have told us that most children’s shows show little or no gender difference, and that girl-led shows were watched in pretty much equal numbers by boys and girls. 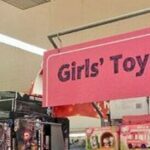 But all too often a programme or character which is loved by boys and girls alike is suddenly a ‘girl’ or ‘boy’ property once you hit the toy shelves. If you’re a kid who loves the wrong programme or story, you’re out of luck. Gruffalo merch? In the boys’ section. Love Peppa? If you’re a boy, you’re only allowed to have George on your socks. It’s absurd to argue this is because the girl characters don’t sell to boys – as if anyone would be put off buying a 12 figure set by a couple of plastic breasts sneaking in. The real agenda is about keeping children in their profit-generating place. If toy companies have the girl market stitched up with pink princesses they have every incentive to stop children from ‘crossing over’, meaning the toy companies would be competing with themselves. It suits them much better to keep kids safely in their pink and blue boxes. But what on earth are children to make of this? There are few enough female characters in the first place without losing them to some kind of cull once they reach t-shirts. Why do we have such low expectations? Many mentioned Octonauts, which has two female characters in the core Octonaut team, including an engineer. But that’s a pretty low bar for ‘good representation’, two female characters out of six/seven. (And engineer Tweak appears in the toy playsets remarkably rarely…) One of our supporters had totted up whether the ‘wildlife’ characters were referred to as ‘he’ or ‘she’. Fewer than one in five were female. All credit to Marc for taking the tally, but most of us probably wouldn’t notice. We’ve all been trained to have pretty low expectations of how many females are going to turn up. And many others pointed out the other gap. Why are there so few gentle and caring male characters? Lola’s brother Charlie, Peso in Octonauts – they stand out because they’re unusual. Why does it feel normal to have so few females? Increasing the number of female characters in children’s media isn’t social engineering. Women have 50% of the speaking parts in real life. But research by the Geena Davis Institute on Gender in Media shows that males outnumber females in family films by 3 to 1. Women are scientists, bus drivers, politicians and astronauts as well as mums, pop singers and ballet dancers. Men are dads, nurses and teachers as well as athletes and superheroes. Women work outside the home. In family films, 80.5% of all working characters are male and 19.5% are female. This doesn’t reflect reality. It’s hardly surprising if children grow up believing that males are more important – from the earliest age the media they consume is telling them this every single day. We often talk about the need for girls to see active and diverse role models, and that’s important. But we’re missing the point if we think that girl characters just need to be there ‘for the girls’. Boys will grow in a world with women and girls in it. Why are we offering them a fantasy fictional world where they seem to be largely absent? There’s a troubling received wisdom in children’s publishing that boys won’t engage with stories about girls. There are two big issues with this. Firstly, it isn’t really true. We keep asking for evidence of this, and no-one’s come up with any yet. As mentioned above, Cbeebies programmes viewing figures show minimal difference in the shows watched by girls and boys. My son has enjoyed Chris Riddell’s Goth Girl, Alice in Wonderland, Reeves and MacIntyre’s Cakes in Space and many more girl-led narratives. Why wouldn’t he? Boys read about girls if they’re given the chance. But boys are told over again that they’re not meant to be interested in ‘girls books’. 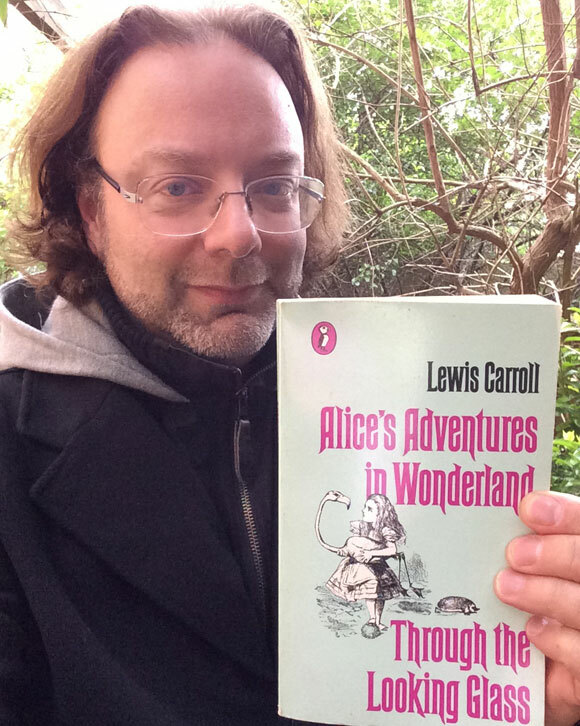 It had never occurred to my son that he shouldn’t like Alice in Wonderland until the nice lady at the Hay Festival apologised to him that the craft theme today was Alice, ‘which the boys don’t really like’. Secondly, if it’s true that boys shy away from narratives about girls, our response should surely be to discuss and challenge that, rather than roll over and accept it. Surely the purpose of stories, our profound human need for narrative and fantasy, is all about learning empathy, and thinking about what it’s like to walk in another’s shoes? Teaching boys that they’re not even allowed to think about what it might feel like to be female is hardly setting them up for respectful and understanding relationships with women. A few token ‘strong female characters’ simply isn’t enough. We need children’s media to tell children the truth – that females exist in equal numbers to males, and that they matter just as much. That doesn’t sound like too much to ask. Everything in this post is absolutely right. Thank you for showing again what is really going on with the aggressive gendering aimed at our children, and for taking such a powerful stand against it. Very glad to see you getting increasing recognition and this sort of platform. I want to add a few thoughts. As well as maximising corporate profits in the children’s market, there are many other things at stake for the people behind gendering of children’s toys, clothes, books, and entertainment. The western world is run on a neoliberal model of capitalism that depends on various kinds of compliance for its success. First, it needs to make sure that most of the population are consumers, and will spend their available income (and more) buying products, most of which aren’t really needed. If people get into debt doing it, all the better: for even more money can be extracted from them in interest and they become vulnerable to additional coercions. The fashion, beauty, lifestyle, wedding and women’s media industries depend on women being raised to believe that it is essential to spend money on their outward appearance and their homes, judging other women by standards set by the producers of these goods, and failing to be assertive in other spheres because so much attention is given to these entirely manufactured needs. There are parallel industries that cater for men’s masculinity, the car industry being one, but also the military-industrial complex and various other sources of enormous profit which are supported by male voters who believe that their own masculinity is implicated in the military strength of their country. And so it goes on. Beyond this: raising girls to base their identities on domestic activities and to focus their aspirations on being a glorified homemaker and child-bearer (aka a princess) is the best way to secure what is absolutely necessary for our current economic system: the unpaid labour of millions of women, who give birth to children, raise them, do the bulk of domestic chores, look after ill or aging relatives. In order to do this, women also become willing to take on poorly paid and undervalued jobs that others won’t do, or to accept discriminatory treatment by employers (who merely want to save money by holding down their salaries and withholding bonuses) uncritically believing it to be deserved because of their ‘choices’. They then work all the harder to compensate. We have to ask whether a different and more empowering upbringing would enable women to critique and fight all this, and certainly not to submit meekly. Finally, teaching boys that so-called ‘feminine’ qualities of empathy, gentleness, peacefulness and fairness/sharing rather than aggression are not manly is a recipe for ongoing domestic and public violence, mental health issues and dysfunctional relations between the sexes. None of these things are of interest to corporations unless they can make money by privatizing mental health provision/prisons, etc. Instead, there is a larger economic goal of ensuring that men, who have the louder public voice, are less likely to oppose the rampant injustice and greed of our economic systems, destruction of the environment in pursuit of profit, the brutality with which we treat non-western nations, the valuing solely of money and other tangible measures of success as defined by neoliberalism, and so on. They have been taught from a very early age that all these are commendable masculine behaviours and values and that dissenting from them is ‘like a girl’. There is a lot more that could be said along these lines, but it is no exaggeration to say that the same forces as, for example, are forcing the Greeks to accept a savage and unnecessary regime of austerity are also deliberately damaging our children in the service of corporate profits, the creation of an underclass of unpaid domestic workers and a wider social conformity in which limited gender roles, truncated imaginations and excessive emphasis on unimportant things play a major part in perpetuating the status quo. This article is amazing. Also it occurred to me that growing up I always figured charlie from charlie and lola was a female. And that it was a basic show following two female sisters. As a teenager now, I have begun a photo project titled more than a colour which illustrates issues with gender roles in today’s society, and I am also a very strong feminist, who believes in equal rights among all humans. Recently I took a women’s history class and the whole class had made a consensus about the lack of female merchandise for superheroes and the way books label are kids. For example, a book for with BOYS ONLY on the cover tells boys how to survive a crocodile attack and how to start a fire, the girls version tells girls how to survive sudden stardom, and teach your cat to sit. Anyways, I love this article and I love this website.